Timothy J. Todish, illustrated by Gary S. Zaboly. Softbound, 344 pages, 8" x 11". 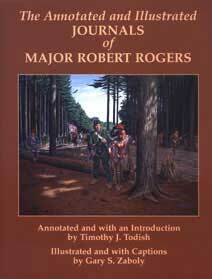 Major Robert Rogers of the Rangers is not only one of the most famous men to come out of Colonial America, he is also one of the most fascinating. This book,reprinted from the rare 1769 Dublin edition of his Journals, allows the major to tell portions of his life in his own words. To supplement his accounts, numerous annotations have been added by Todish to give a broader picture of the events described. Most are from eyewitnesses, or at least contemporaries of Rogers. Later secondary sources are used sparingly. Zaboly�s wonderful original illustrations, along with his well-written captions add an invaluable dimension to this edition.